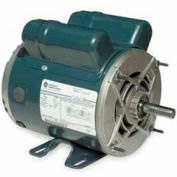 Leeson Motors - 1/2HP, 115V, 1625RPM, DP, Round Mount, 1.0 S.F. 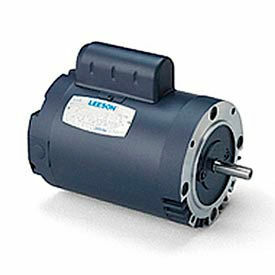 Leeson Motors - 1/2HP, 115V, 1625/1350RPM, DP, Round Mount, 1.0 S.F. 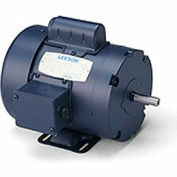 Leeson Motors - 1/3HP, 115V, 1625/1350RPM, DP, Round Mount, 1.0 S.F. Leeson Motors - 1HP, 115/208-230V, 1725RPM, TEFC, Rigid Mount, 1.15 S.F. Instant Reversing Motor: 1/2HP, 1625RPM, 48 Frame, Drip-Proof (DP), 115V, 1PH, Continuous duty, Manual thermal protection, 1.0 Service Factor, Round Mount. Instant Plug-reversing with simple three wire connection. Permanent split capacitor design offering low in rush and full load amps. Manual reset overload protector. Starting torque approximately 150% of full load, not suitable for hard to start loads. Leeson Motors - 3/4HP, 115/208-230V, 1725RPM, TEFC, Rigid Mount, 1.15 S.F.